It’s that time of year again. Along with fresh pencils, and new, cool lunchboxes, a new backpack, or at least a more lightweight backpack might be in order too! Kids backpacks should be no more than 10 to 15% of their body weight. 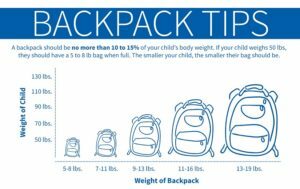 If your child weighs 50 lbs, they should have a 5 to 8 lb bag when full. The smaller your child, the smaller their bag should be. Backpacks for kids need to be worn with both straps in order to evenly distribute weight. Otherwise it can cause neck and back pain for the wearer who has to compensate for the weight of the bag and adjust their hips and shoulders unevenly. The spine is made up of 33 bones which can be compressed unnaturally if your child’s backpack is too heavy or worn incorrectly. 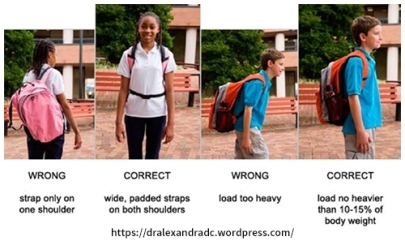 An unsafe or heavy backpack can create issues with posture that continue even after the backpack is no longer worn. Less is more: The smaller the backpack, the less your child will fit into it. Encourage your child to clean their backpack out every night after school and repack it for the next day. This way they aren’t carrying around a heavy backpack with unneeded items. Two straps are better than one: Messenger bags, satchels and purses that force weight on one shoulder can be more detrimental than two strapped bags. Comfort is king: Padded straps are a must when choosing a backpack for school. Narrow or unpadded straps can dig into shoulders and cut off circulation. Click Here to see all of our blog posts. Want more information on children’s development? Use these tips to make bringing kids to restaurants easier for the whole family. What Chores Are Right For My Child? When Will My Baby Smile? What is a Pediatric Occupational Therapist? What is a Pediatric Speech-Language Pathologist? 5 Ways to Make Going to the Dentist Fun! How Can New Dads Bond with Baby? Getting Preschoolers to Share…How Do You Do It? Why Are Mirrors Good for Baby? Did You Know Moms and Dads Read Differently? How Can I Practice Baby Sign Language? What is Animal Assisted Therapy? Has There Been a Rise in Food Allergies? How Many Extracurricular Activities is Too Many? 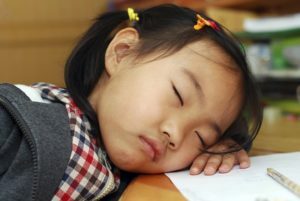 What are Hypertonia and Hypotonia? What are Augmentative and Alternative Communication? What Is Positional Plagiocephaly & Positional Torticollis? Have You Started Tummy Time Yet?